Extra bus stops will also be opened in Wright while Coombs will receive some new stops, including one at the Charles Weston School. Route 83 and Xpresso 783 services will be extended to Coombs. It is anticipated the bus services will begin operating in the “next couple of months”. 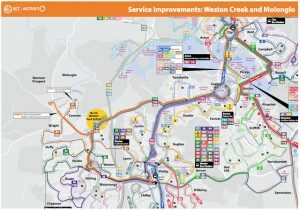 The Weston Creek Community Council has been lobbying the ACT Government for improvements to Weston Creek/Molonglo bus services for many years – in particular we have been arguing for an all-day direct service from Weston Creek to the City as what’s really needed to increase public transport uptake in Weston Creek/Molonglo. However, for all too many years our suggestions appeared to fall on deaf ears and Weston Creek public transport remained woefully inadequate compared to many other parts of Canberra. It’s encouraging that our submissions have finally been taken on board and real change is happening. Watch this space for more information on the new and improved bus services. The ACT Government’s announcement comes following a comprehensive revamp of the bus network announced by the Canberra Liberals in their transport strategy earlier this year. The Liberals’ plan contains many important improvements aimed at improving bus services throughout Canberra – including Weston Creek/Molonglo, which is great to see. Now let’s look forward to the Weston Creek area public transport maintaining such attention in the coming years!